Skateboarding was born on the west coast of the U.S.A. as a street version ofsurfing. Over the years it has become more and more popular and now in Europe there are many skaters, as many as in the U.S.A. In line skating, an evolution of skating, which allows people to perform tricks in a similar way to skateboarders, has also become incredibly popular in the last few years. Cornwall has purpose built facilities for these sports in several towns including Penzance, Camborne and Mount Hawke. Facilities at Penzance and Camborne are free. 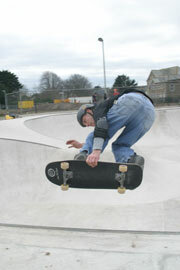 Penzance has a brand new concrete bowl which was completed at the end of 2004. It is at easy walking distance from the town centre and the bus/train station. The structure includes some curbs and 2 handrails which can be used one from each side and a smaller half bowl (about the size of a mini) for beginners. The main bowl is quite deep so it provides ideal conditions for experienced skaters. Penzance has another skatepark on the seafront. This includes a half pipe, a horizontal rail and a long grind/slide curb about half a metre tall. 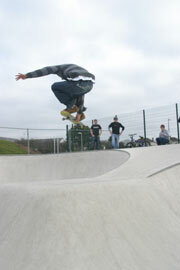 Truro skate park was opened at Hendra, Truro in May 2009. The project which has been four years in the making is a 530 square metre park incorporating ramps, bollards, steps, railings, a clover leaf shaped bowl and a 14 metre mini ramp. It was designed by Anthony Greenwood, an experienced skateboarder in consultation with many other local skateboarders and aims to provide a different skateboarding experience to those already available in Cornwall. Free entry. In the countryside just outside of Mount Hawke village there is a very big indoor skatepark. The structure includes: 2 fun boxes, 1 half pipe, 1 wallride and much much more. There is also an area for beginners with smaller structures and lower curbs to start sliding and grinding. 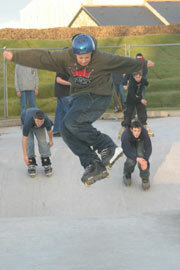 Newquay, Helston, Reawla near Camborne, Phillack near Hayle and other towns throughout Cornwall also have skateboarding parks and facilities. If you'd like to see your local skatepark featured here please send us details by email. Vert Halfpipe, 2 joined mini-halfpipes, launch to flatbank, vert wall, spine, fun-box, rails, ramps.